The Waterford Hockey Club players celebrate their Irish Hockey Trophy Final win on Sunday. 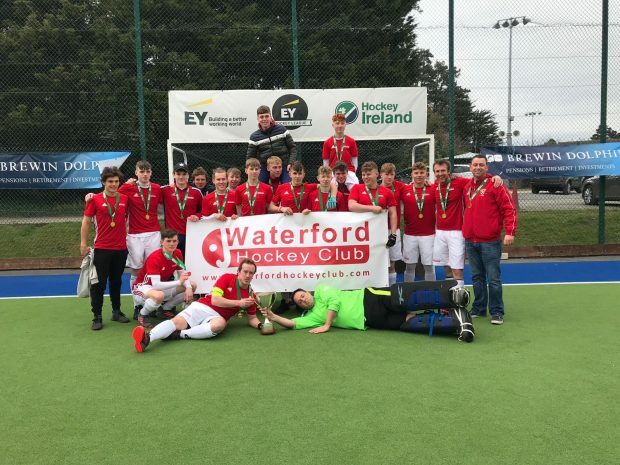 Waterford completed their fairytale rise from the brink of extinction to win their first national cup title in decades when they beat NICS 3-1 in the Irish Hockey Trophy final at Grange Road on Saturday. Ben Johnson is one of the stars of Irish hockey and he produced a virtuoso performance in this final, scoring two drag-flicks and generally being unbeatable in each one-on-one encounter for the ball. Harry McCarthy – their other Irish Under-21 panellist – fizzed home the other for a 3-0 half-time score-line. Service fought back in the second half and got on the board via David Whittington but the Deise side were not to be denied a first win at this level and a first national title in more years than they care to remember. In their last match of the season Waterford produced their best performance. Following a tight and scoreless first half the girls scored the opener, to be quickly followed by an equaliser from Crescent. Waterford though took control in the last quarter and scored three goals in quick succession. The season is nearly over with Men’s First team seeking second place in their inaugural Division 1 campaign, playing two matches this weekend. The final Academy session takes place on Sunday the 28th with the club’s fundraising Ball Run.